Those paying attention to America’s student-loan crisis might know the staggering statistics by heart: The total student debt burden now sits at more than $1.2 trillion, and the most recent grads left school $35,000 in the hole. Of course, numbers don’t tell the whole story. So we sought out eight borrowers from around the country—many of whom are shouldering burdens significantly above the average load—to tell us how their student debt affects them on a daily basis. These aren’t just recent grads: They range in age from 23 to 49, and owe from $14,000 to nearly a quarter-million dollars. Here are their stories. Long Island University and The Flatiron School in New York. I left LIU after my junior year in 2010 because my mom could no longer afford the tuition, which grew from $32,000 to $40,000. I didn’t have a high enough credit score to take out additional loans alone. I wanted to pay down my loans and support myself, so I worked for a few years as an events coordinator and at a PR agency. When I received a small inheritance from my grandmother in 2013, I started looking into new schools. That’s when I discovered The Flatiron School, which trains creative people in Web and mobile development, and its partner program, The NYC Tech Talent Pipeline. 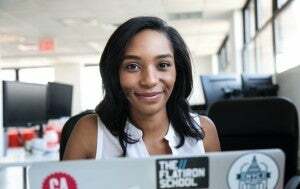 I won a full $1,200 scholarship to attend Flatiron in January 2014, and completed the program in six months. Then I did an internship at MasterCard, which turned into a contract position that ended in February. Now I’m looking for positions as a user experience designer. Are you currently making loan payments? I am. The only time I deferred them was while I attended The Flatiron School. My mom and I initially took out about $62,000 in private and federal loans, with interest rates ranging from 6 to 10 percent, but I’ve been paying them with income from my paychecks, as well as $8,000 of my inheritance. (I’m currently paying $1,000 a month.) My mom also paid about $15,000 over four years, so my current balance is $25,000. If you had to do it again, would you take out student loans? Yes. School wasn’t affordable any other way. I had scholarships and worked, yet still owed half of my tuition. But maybe I’d go to a community college for two years, then transfer to a four-year college to cut costs. Any advice for current college students? Live at the Bursar’s and guidance offices to learn how to get the most out of the financial aid package. Find out about scholarships, ways to earn accelerated degrees and nontraditional routes.